in DIY, free, frugal • This post may contain affiliate links. Read the disclosure policy. If you are looking for an inexpensive yet fun gift to give to someone like your child’s teacher, a neighbor, friend from church, friend from your MOPS group or a hostess gift for one of the many holiday parties you will be attending here is a great and simple item! 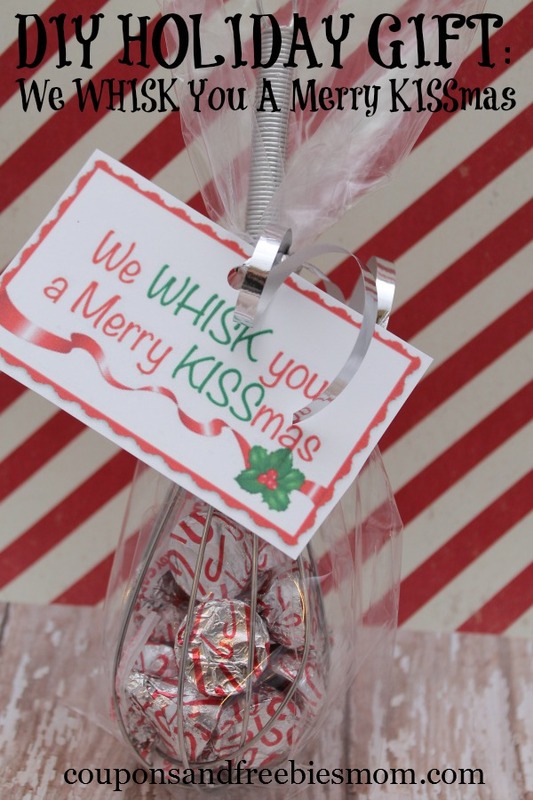 DIY Holiday Gift: We Whisk You A Merry KISSmas is a super easy and inexpensive gift that looks adorable and makes everyone smile! 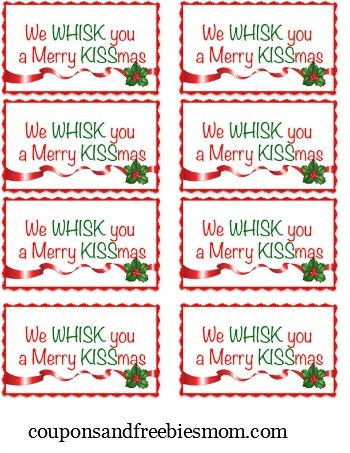 Go HERE to print your We WHISK you a Merry KISSmas Cards or simply click the image below! This DIY Holiday Gift is a great one for low budgets. Most Dollar Tree or $1 Shops carry wire or plastic whisks for only $1 each. A bag of Hershey’s Kisses can be picked up for under $2 after coupons this time of year with great sales. Cellophane bags are easy to find at any retail store for $1-$2 for a bag of 12-15 bags. A roll of ribbon is $1. You can spend $10 to make 5 great teachers gifts for your children to give out at their holiday parties this year! To create an extra special gift you can pick up inexpensive baskets or casserole dishes on sale and fill them with this, a boxed cake mix or brownie mix, a bag of chocolate chips or mint chips, a pot holder and a kitchen towel and spend just a few dollars to give someone a great, fun and useful gift that they can enjoy with their family! What a CUTE idea. I love that it’s handmade!